TaraTeaspoon » Baking + Desserts » Chocolate Skeleton Cookies • With Video! 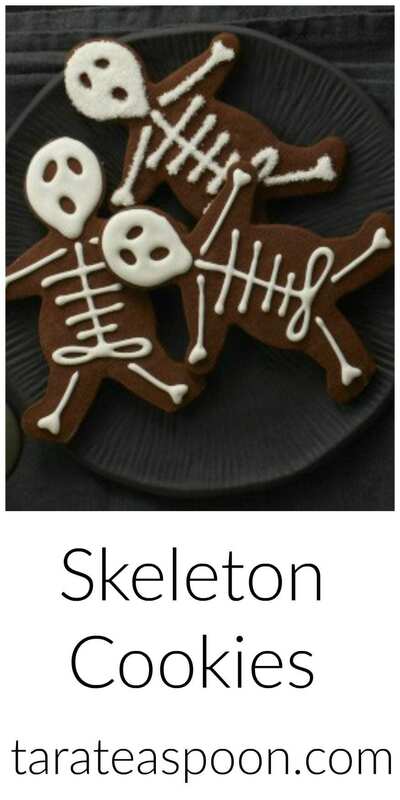 Chocolate skeleton cookies are nothing but good old bones! Sweet icing bones and dark chocolate cookies, that is. Nothing says Halloween like a Gingerbread Man. Oh…wait…using a gingerbread man cookie cutter—that’s where I was going with this. Change that little shape into a creepy skeleton and you’ve got something. Swap in chocolate cookie dough for the spiced standby and a ghoulish face for the smile, and you have some crazy fun Halloween treats. 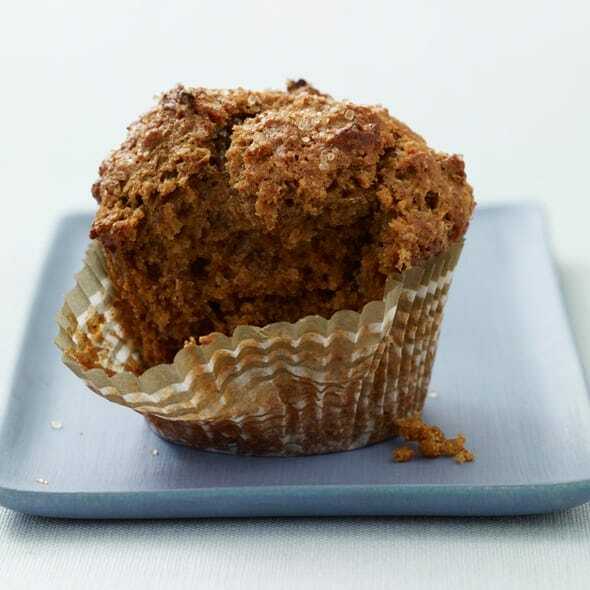 The simple design makes these a go-to Halloween treat. Skeleton cookies come together in no time. I even added a little sanding sugar sparkle to some. My chocolate cookie is a dark, rich and buttery roll-and-cut recipe. You can make the cookies ahead and ice them anytime. They can keep in an airtight container for several days. 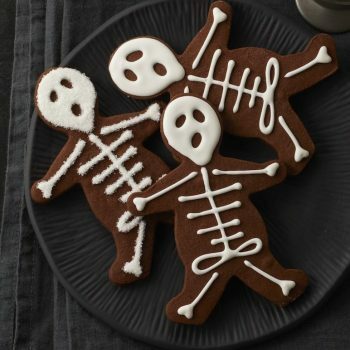 These Skeleton Cookies are easy to decorate. No need for perfection. No one is counting how many ribs they have or how big their eye sockets are! The royal icing is the perfect smooth and sweet topper. 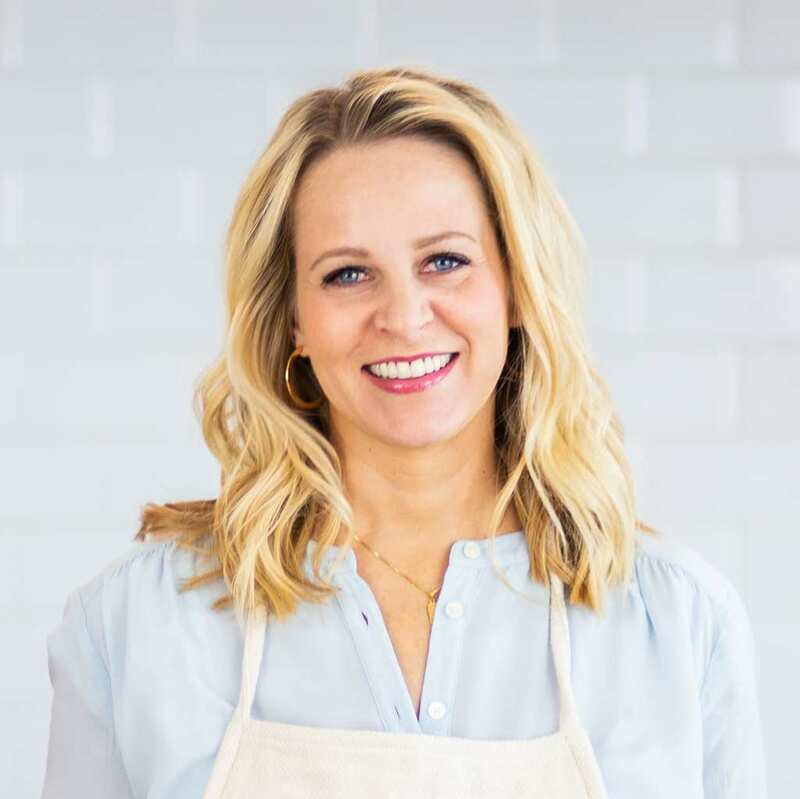 I use meringue powder instead of raw egg whites, which makes the icing food-safe and easy. How perfectly do the bones make these little gingerbread men look like skeletons? I love it. My skull faces sort of take on a Scream painting look, and no two are the same. That’s the beauty of these little guys. Perfection is not the deal when piping these bones. No one is counting how many ribs they have or how big their eye sockets are! Cooking tip: Royal icing looks great piped onto cookies (that’s why we food stylists use it!). It solidifies to make a lovely un-smearable decoration. It even tastes sugary and good. However, if you don’t have powdered egg whites around to make it, and/or you love a butter-based frosting, then by all means use that instead. It won’t be as smooth, and it will most certainly smear if it’s touched by curious-kid-hands. It will still be cute and quite tasty! 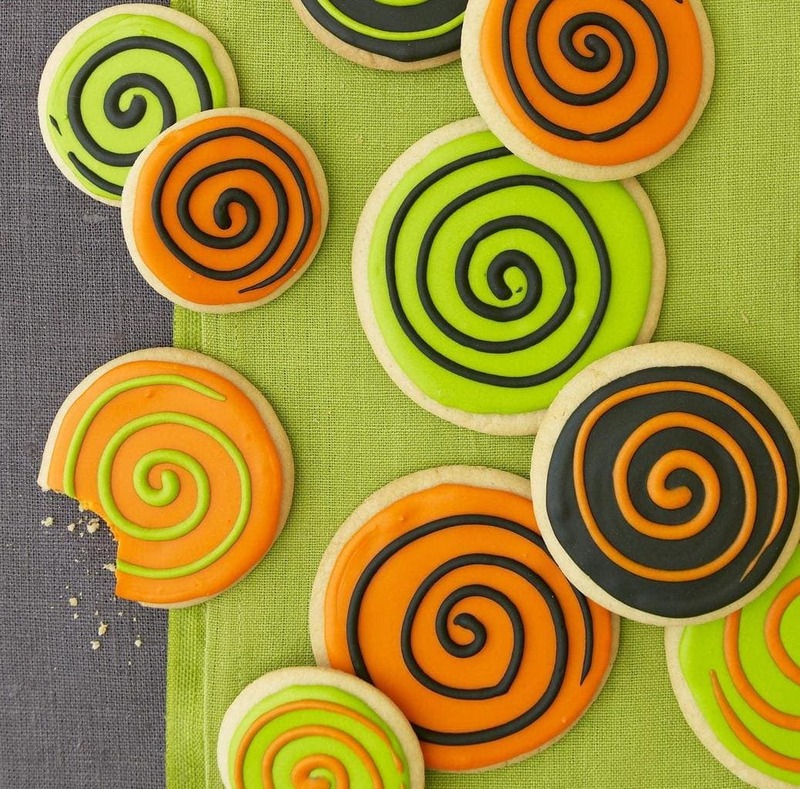 I’ve used royal icing on several of my Halloween treats, like these Spooky Spiral Cookies. 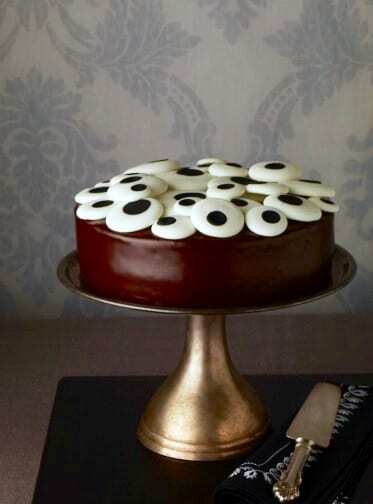 And I made my Eerie Eyeball Cake eyeballs with royal icing! It looks good on chocolate cookies, sugar cookies and gingerbread! Keep that gingerbread man cutter handy until December. 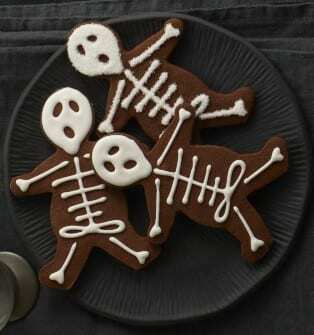 These skeleton cookies are so cute packaged as favors in little cellophane bags, or just piled on a party platter. Watch my video to see just how easy they are to make!! Dark as a spooky night, these cookies are made from a rich chocolate dough, with just a hint of cinnamon. Whisk together flour, cocoa, salt and cinnamon; set aside. Using an electric mixer, cream butter and sugar until light, about 2 min. Beat in eggs and vanilla. Working in two batches, add flour mixture and beat until just combined. Divide dough in half and wrap pieces in plastic wrap, flatten into disks and chill 1 hr or overnight. Heat oven to 350ºF. On a floured surface roll dough to ¼ inch thick. Cut with a 5-inch gingerbread man cookie cutter and transfer to unlined baking sheets. Reroll scraps once. Bake until cookies spring back when touched, about 12 min. Cool on wire racks. Prepare 1 recipe Royal Icing. With an electric mixer mix confectioners' sugar, meringue powder and water on low speed, scraping sides of bow,l until icing is the consistency of soft whipped cream, about 10 min. Transfer to a piping bag fitted with a #2 plain tip. Decorate with lines for a skeleton. Pipe an outline of a skull and circles for eyes and mouth; flood face with icing. Sprinkle some with sanding sugar. Dry completely. Oh thank you! Im so happy Peggy is following! Love you guys! These little guys turned out so cute, and I bet they taste delicious as well. I have always loved themed desserts and snacks for Holidays. I bet my daughter would have fun trying to make these one night. Those are some great looking cookies and the icing looks good too. I never made my own icing but this recipe looks easy and fun to work with. You are great at designing treats! I always get bored in the middle and make everything look like blobs. Lol. 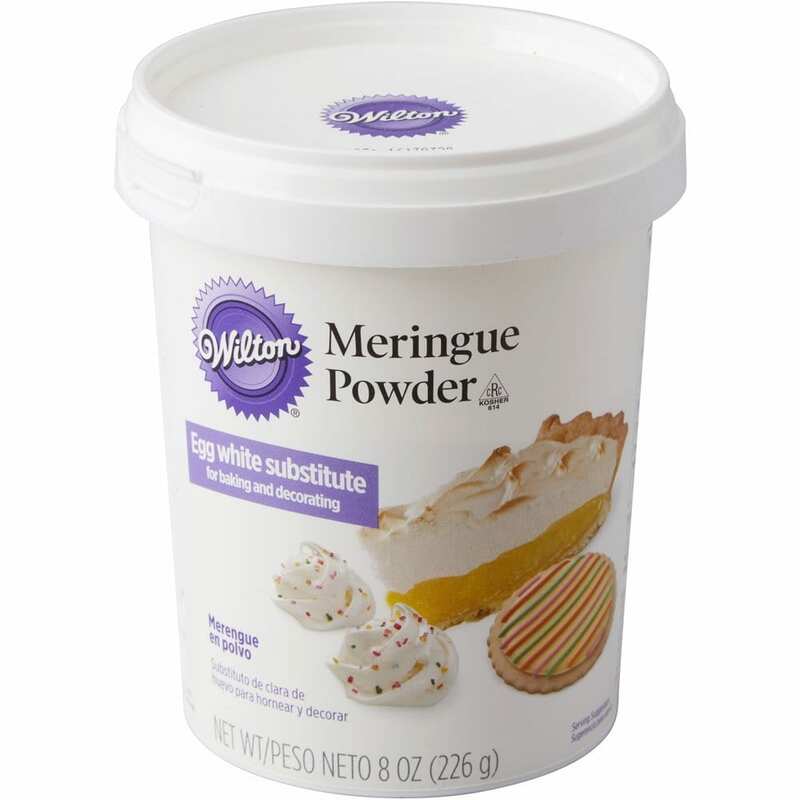 Is meringue powder in the baking aisle? I’ve never used it before. Oh thanks!! Yes at many grocery stores it’s in the baking aisle. But sometimes they have it in the health food section. Sometimes it’s just called powdered egg whites. Michaels for sure has it in the cake decorating section! ALSO you can use the link above, in my post, to order it online. Those are super cute and would be fun to give to the neighborhood boys. ALL my neighbors have sons, which will be great in about 5 years when they can shovel my snow and mow my grass! Until then, I need to load them up on cute treats like these! Oh good idea! Nice thinking ahead!! These are so clever and I know that if I tried to recreate I could definitely not make them look as good as you – that’s awesome talent to get the piping that good! Oh you are sweet! But the piping is so forgiving. Just bones! These are so cute and so well decorated! A quick and easy Halloween treat! Thanks for sharing! 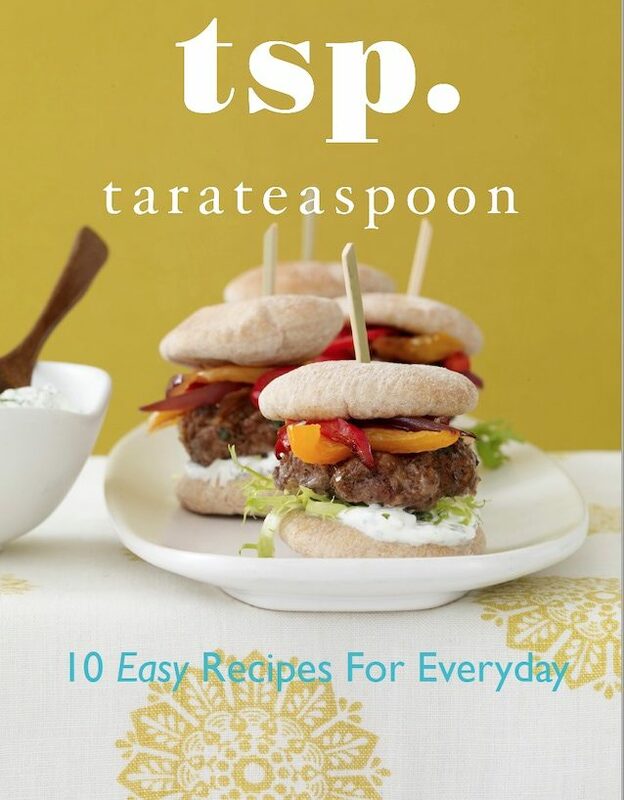 There are so many fun and yummy recipes this Fall that I would love to try! Being a teacher, I’m sure this recipe will be appreciate by my students! It’s adorable and it looks so good. These are for sure fun teacher to student gifts! How fun! Every single October I say that I’m gonna break out my gingerbread man shapes and make skeletons. Every year I fail at that…because I always forget. These are just so cute! Those skeleton cookies will be a hit with the kids especially my youngest. I’m sure she’ll really enjoy those too, since they’re chocolate! Thanks for the lovely recipe! These are so funny..and the perfect mix of creepy and adorable. I love the idea of little cookie bones! These skeleton cookies are so cute and a great alternative to candy treats for Halloween. What a cool idea to use the gingerbread man cookie cutter. My boys would go crazy for these cookies thanks for all the tips on how to make and decorate them. For sure! I hope the video helps! Oh these look so cute and so easy to do! I’m going to have to save this if I need something to bring for a party!! Oh look how cute these are! I am the worst when it comes to frosting cookies! These are forgiving! Have a good Halloween! These are so adorable! Never thought to use a gingerbread man cookie cutter and decorate a different way. 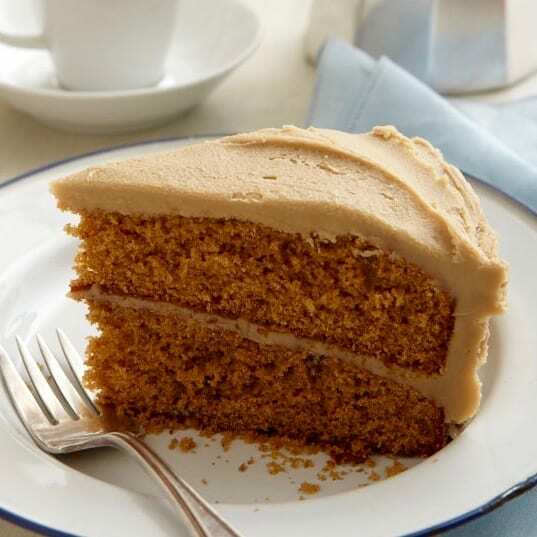 And not too complicated which is always nice when it comes to baking. These are very cute for Halloween! I’d love to make these with my kids to enjoy after a night of trick or treating! These are so adorable! I think my kids will absolutely LOVE making them for Halloween!! This is a genius way to turn a gingerbread man into a ghoulish skeleton. What a fun treat to make with your kids or to create for a Halloween party. These are adorable and look like so much fun to make! My oldest daughter would really enjoy making a batch with me for a Halloween party this weekend! Stop it with this cuteness! I just watched all of the Scream movies in preparation for Halloween 😉 and the little face on these reminds me of that mask. Love! Your Skeleton Cookies turned out super cute! 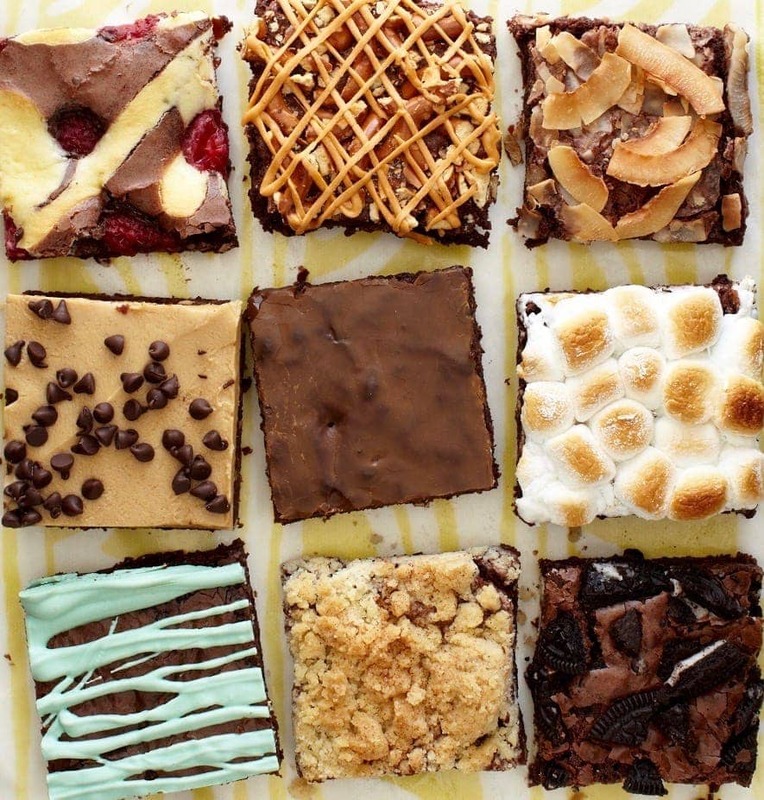 I would love to try making these sometime! Thank you! Have fun when you do! These are so cute and would be really fun at any Halloween party! I love these! Your ideas are delightful!